I am currently working on two projects while I romantically dream of three yet to be other projects. My sunshine yellow shawl is heavenly to knit. The yarn is beautiful in person, there's a slight halo but the silk and cashmere give it a softness that makes me want to keep knitting forever. The pattern is complicated enough to keep me on my toes. The hat is my tv knitting project, I tend to make few errors while knitting round and round. 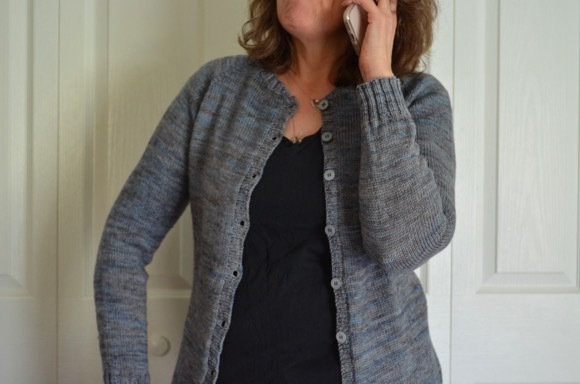 Oh and if you haven't seen my blog post from yesterday, I finished my wicked cardigan (finally). I started a new book this past week, Here on Earth by Alice Hoffman, who I just love to read because I love her writing style. However this story is a remake of Wuthering Heights and I'm not sure how I feel about that. To me the classic is a stand alone book, one of my favorites. I am still in the beginning and I'm still thinking back to the classic. I'm hoping that after a few more chapters I'll stop comparing and get engrossed with the current plot. Stay tuned. I love the color of your shawl. Very pretty! 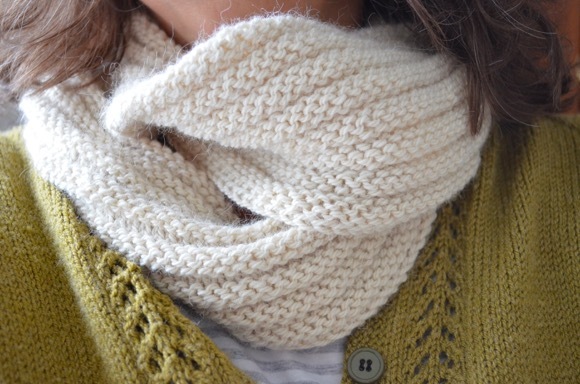 I love laminaria ... one of many shawls on my to-knit-someday list. :) And that yellow is so cheerful! They both look amazing Karen, love the colors...and the pattern in the yellow looks so unique. I love the description of your yellow yarn and really wish I could touch it, it does look so beauitful! That yellow is gorgeous! I think that you and I like the same autumn type colors! Beautiful colors! I'm so partial to yellow leading into fall and winter. I always need some brighter colors to make it through those seasons. I really like your colorful hat! Really beautiful yarn choices, as usual, Karen! I see autumnal colours creeping in which is making me crave a (correct) seasonal project. I'm interested to know what the three projects-to-be are..
That yarn is pretty scrumptious looking. Wrap yourself in it and never come out scrumptious! Yellow is my favoritest color, so I am just *loving* your Sunshine Shawl! I haven't read that title yet (I love Alice Hoffman, too). I remember seeing the title at the library, but I may have skipped it because it is a re-telling; I'm not very fond of those types of books, although I did like The Flight of Gemma Hardy (which I read after seeing it here). I love your yarn choice and the project looks beautiful! I'm with you, when it is a great work of literature I agree that I don't want anyone 'remaking' it, but like you when it is an author like Alice Hoffman, I'm willing to give it a try. 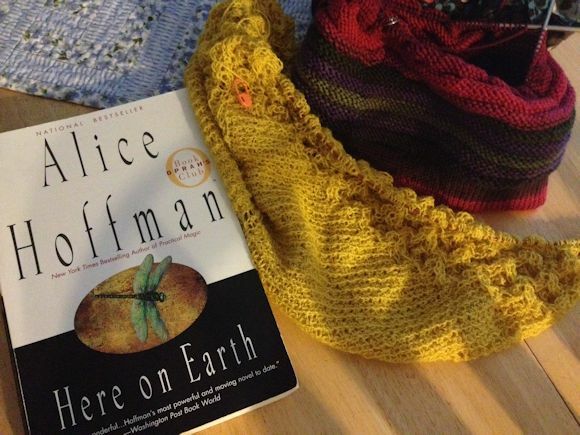 I am loving your wips - the yellow shawl looks wonderful! The shawl color is beautiful as is yesterday's wicked cardigan. I will have to try an Alice Hoffman book. She is new to me. Looks beautiful :-) - I love the colour! You had me at silk and cashmere. That looks heavenly. I love that yellow, just gorgeous! Sunshine yellow - the colour of Summer.....gorgeous. I really must knit something in such a beautiful yellow - I love it! What a beautiful light in the picture! So pretty! I love the yellow, it's such a warm beautiful color! Lovely colour. There's so much to catch up with over here I'll come back tomorrow and have a good read. I want to have a good look at your wicked cardigan...what an awesome name. Nice! I tend to have several things going at once also. Right now I'm trying to finish a hat for Max to match his sweater. And I'm reading Major Pettigrew's Last Stand and loving it. Lovely yellow, reminds me of butter. Pretty knitting there. Love your knits, can't wait to see what your 3 yet to be projects are.